At last month’s International CES in Las Vegas, NV, it was YBLTV’s first real, in-depth look at Belkin, creator of people-inspired technology products – and that they truly are! At the Show, Belkin announced WeMo SMART, a program designed to bring its simple, Wi-Fi based WeMo home automation platform to new brands and a wider variety of household devices. Jarden Consumer Solutions (“JCS”), a leading provider of global consumer products brands, will be the first company to partner with WeMo SMART for its Sunbeam®, Crock-Pot®, Mr. Coffee® and Oster® brands. Thanks to Ohad Zeir, Belkin’s Director of Product Management Growth Platforms, YBLTV got a inside look at the Belkin connected home! “With Belkin’s focus on the tablet and smartphone market and recent successes in creating simple solutions for Internet connected devices, it is a natural partner to help some of JCS’s best-known brands create appliances that people can use to make their homes smarter, safer and more flexible,” said Alejandro Pena, Senior Vice President and General Manager, Global Appliances. By expanding WeMo to other known brands and appliances, Belkin gives people the ability to remotely monitor, program or interact with more devices in their homes from anywhere. The first JCS products with WeMo will launch later this year, with additional product offerings through 2014. It was so exciting to experience this interactivity! Building on the success of its WeMo launch in 2012, Belkin also announced at last month’s CES Show two new developments to the WeMo brand of simple, ingenious home control products, the WeMo Light Switch and Android compatibility. Ohad showed us on display at Belkin’s booth, the WeMo Light Switch, an Internet connected light switch to remotely control wired household lighting from anywhere. The WeMo Light Switch replaces an existing light switch and connects into your home’s existing electrical wiring. Once in place, you can turn a full bank of lights on and off from anywhere, put them on a schedule, or use other WeMo or online triggers to control them through a smartphone or tablet. The WeMo Light Switch is controlled via the same free WeMo app as the WeMo Switch and Motion, conveniently keeping track of all of your WeMo-enabled devices from one app. Aside from growing the WeMo product family in 2013, Belkin also will launch compatibility for Android devices later this year. As the market share for Android continues to grow and more consumers demand it, expanding WeMo capabilities to Android devices is a necessary step for the continued success and evolution of the WeMo brand. 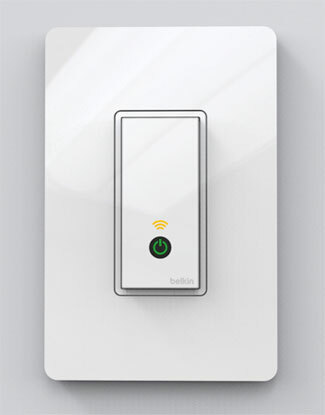 In February, Belkin is launching an open Beta test for users of the Samsung Galaxy SIII and other leading devices and follow with an official launch for the WeMo Switch, WeMo Motion and WeMo Light Switch in the summer. Jarden Corporation is a leading provider of a diverse range of consumer products with a portfolio of over 100 trusted, quality brands sold globally. Jarden operates in three primary business segments through a number of well recognized brands, including: Outdoor Solutions: Abu Garcia®, Aero®, Berkley®, Campingaz® and Coleman®, ExOfficio®, Fenwick®, Gulp!®, Invicta®, K2®, Marker®, Marmot®, Mitchell®, Penn®, Rawlings®, Shakespeare®, Stearns®, Stren®, Trilene®, Völkl® and Zoot®; Consumer Solutions: Bionaire®, Breville®, Crock-Pot®, FoodSaver®, Health o meter®, Holmes®, Mr. Coffee®, Oster®, Patton®, Rival®, Seal-a-Meal®, Sunbeam®, VillaWare® and White Mountain®; and Branded Consumables: Ball®, Bee®, Bernardin®, Bicycle®, Billy Boy®, Crawford®, Diamond®, Dicon®, Fiona®, First Alert®, First Essentials®, Hoyle®, Kerr®, Lehigh®, Lillo®, Loew Cornell®, Mapa®, NUK®, Pine Mountain®, Quickie®, Spontex® and Tigex®. Headquartered in Rye, N.Y., Jarden ranks #371 on the Fortune 500 and has over 23,000 employees worldwide. For in-depth information about Jarden, please visit www.jarden.com. To learn more about Belkin, visit http://www.belkin.com/aboutus or to learn more about Belkin’s connected home visit http://www.belkin.com/us/connected-home. Like Belkin on Facebook at facebook.com/belkin, and follow them on Twitter at Twitter.com/belkin.